Near Field Communications (NFC) offers shoppers the opportunity to wave a card or a phone near a sensor and beep, a coffee or train fare is paid for. 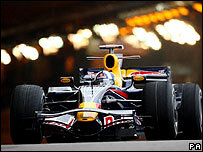 David Reid travelled to Monaco to see the applications that might help NFC take off. A lot of cash clings to this rocky tax-free outcrop, a fact that may have spurred trials of NFC which has been touted as the future of money. It turns a phone into a digital purse that can read the chips and radio tags buried in smart posters from a distance of a few centimetres. 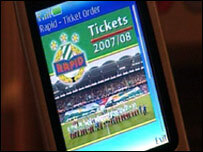 In one example application the data tells the phone to add a charge for a ticket to a football match. The phone gets a message that unlocks the turnstile on the day of the match to let its owner onto the terraces. "What we experience, especially in the soccer environment, is that security is an upcoming issue," says Herbert Pamminger of Skidata which is behind the football ticket trial. It could also be equipped with biometrics to help kick hooliganism into touch. "Organisers are watching out for people who are not allowed to enter the stadium," he says. "And this combination of biometrics is one approach." The ability NFC gives a phone to unlock a turnstile could also be used in other ways. It could mean, for instance, that once a traveller has paid for a hotel room online the key to get in the room can be texted to them. "In addition to the key itself the guest will also get a welcome receipt specifying the room he is staying at," says Gard Gabrielsen from electronic lock maker Vingcard Elsafe that has developed a hotel booking system using NFC. "He will also typically get the GPS coordinates to the hotel he is staying at," he adds. "But the key thing is that when the guest is then coming to the hotel he can totally bypass the reception desk and go straight to his room," he says. "The telephone itself will open the door by just presenting the phone in front of the card reader." A team from the University of Applied of Sciences in Hagenberg, Austria is looking to use NFC to stop skis being stolen. 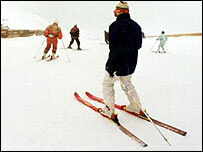 Skis are a pricey piece of equipment that are frequently stolen when holiday-makers prop them up outside a cafe. But add a tag onto your boots and a reader onto your skis and you can make sure that your boots and your skis are united while on the piste. If someone tries to slalom off with your gear then an alarm sounds. University of Rome has developed a virtual shopping basket for people to order household staples on their mobile. But more excitingly the same technology could also link to media and information too voluminous or specific, like individual product history, to put on a packet. "You can put indirect information, which means you can write a URL, a link to some place on a network you can access," says Stefano Puglia, from the University of Rome. "The idea is that by simply touching the object you can open up a connection to a site and have this information displayed on your phone," he says. Despite the innovative ideas NFC is stuck in that difficult territory that lies between commercial availability and widespread use - though there are large scale deployments of NFC in London and Vienna for public transport. The applications will not see ubiquitous use until all phones come fitted with NFC readers. But handset makers are not going to put the technology in their phones until there are enough applications out there to make it worthwhile. Those behind the technology are convinced NFC will enjoy the same success as Bluetooth and eventually it will be hard to find a phone without it. Though it should be said that it has rivals such as the Nokia-developed Wibree and low power extensions to Bluetooth. "All the major handset manufacturers are members of the NFC Forum, and they are all actively involved in working on the specifications, following the developments and are in most cases working on prototypes," said Paula Berger of the Near Field Communication Forum. "We would expect them to be rolling out handsets some time in 2009, at the latest 2010, but probably 2009," she adds.